In the quest to create a wholesome, high-quality, great tasting cookie, Greg Woodworth and Kelly Coughlin began experimenting with their cookie recipes from culinary school. Pure, simple ingredients became the basic requirements for every recipe. 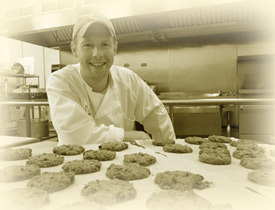 Local co-ops and specialty food markets supplied most of the ingredients necessary to produce what were to become Stony Brook Cookies. After countless tastings with friends and businesses, it was clear that pure ingredients really made a difference - especially when compared to other cookies that used hydrogenated oils, artificial ingredients and sulfite preservatives. Our ingredients list tells it all. High quality extends to the cookie packaging as well, selected to maximize flavor and presentation and to minimize environmental impact. Packaging includes 100% recycled paper boxes, biodegradable cellophane bags and packing peanuts. SBCC is constantly seeking new ways to improve and develop its products and services. Please email us any suggestions or comments and we look forward to serving you! SBCC is owned and operated by Gregory Woodworth and Kelly Coughlin. 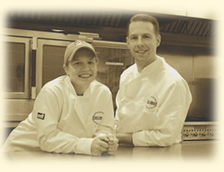 They have recently opened a professional kitchen at the Cornell Agriculture & Food Technology Park at 500 Technology Farm Drive, Geneva, New York. Handmade all-natural cookies, made by hand in an artisan bakery. Gourmet cookies shipped next day. All-natural ingredients, no trans fats, no hydrogenated oils, trans fat free, no preservatives. Chocolate chip cookies, gourmet cookie delivery, order cookies online, gourmet cookie delivery, cookie delivery, cookies, cookies with chocolate, cookies with nuts, cookies with oatmeal, cookies with cranberries, cookies with Guittard chocolate, cookies with all natural ingredients and no trans fats and no preservatives with Guittard chocolate, almonds and montmorency cherries. We're from Cornell, Wellesley, and Harvard. We deliver to Boston College, Boston University, and Harvard University. Delivery to colleges and college care package delivery, also corporate gift delivery. Perfect for client gifts and corporate gifts. Our gourmet cookies are chocolate chunk, chocolate chocolate chip, oatmeal cranberry and cherry chocolate chip cookies. © 2006 Stony Brook Cookie Co. All rights reserved.